Ensuring the future of elk, other wildlife, their habitat, and America’s hunting heritage is at the heart of the mission of the Rocky Mountain Elk Foundation (RMEF). Conservation and restoration of natural habitats—along with educating its members and the public at large—is paramount to RMEF’s goals. To date, areas protected and enhanced by RMEF’s efforts total more than 6.6 million acres. The number of acres opened and/or secured for public access for hunting and other outdoor recreation exceeds 772,000. Projects undertaken number more than 9,500. 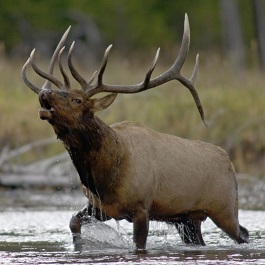 Elk populations have been restored in a number of states. Total monies spent to achieve all of these results are more than $1 billion. RMEF held its first convention in Spokane, Washington in April 1985, which was followed shortly thereafter with the funding of its first habitat project: a grant for a prescribed burn in a place fittingly named Elk Creek in the Kootenai National Forest near Libby, Montana. Today, with more than 210,000 members in 500 U.S. chapters and 11,000 volunteers across the nation, RMEF is more focused than ever.